These days, there are thousands of different teeth whitening kits and treatments to choose from, making it hard to determine how to safely and effectively whiten your teeth at home. For example, there are natural teeth whitening treatments that involve baking soda and hydrogen peroxide, there are over-the-counter teeth whitening products, like Crest Teeth Whitening Strips, and there are do-it-yourself (DIY) teeth whitening kits that utilize teeth whitening gel and a blue light. Some methods work better than others, and often, it’s worth it to schedule a professional teeth whitening treatment with your dentist. 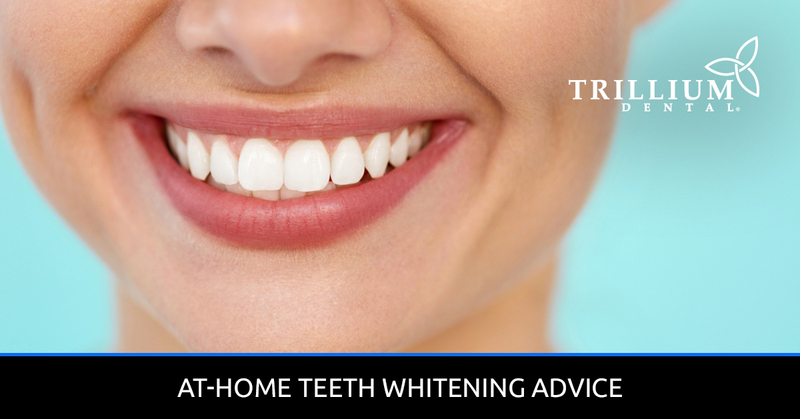 However, at Trillium Dental in Ottawa, we offer both in-clinic and take-home teeth whitening kits, so here are a few tips and tricks for teeth whitening at home. The first step in ensuring that you get the best teeth whitening product available is by doing a little research. Look up dentist-approved teeth whitening kits online, or give your family dentist a call to see what method they recommend. More often than not, your local dental clinic will have some form of take-home teeth whitening kit for you to try, so you can drop by anytime or pick one up at your next dental exam. If you’re planning on ordering a teeth whitening kit online, be sure to also check out customer reviews and read the safety label before making your purchase. One of the biggest mistakes people make when doing teeth whitening at home is that they don’t allocate enough time to get it done. In most cases, teeth whitening gel should sit on your teeth for an hour, and many teeth whitening products say to repeat this process every day for a week or more until you’ve reached the desired results. So, if you’re getting ready for a wedding, graduation, or some other special event, don’t leave your teeth whitening until the last minute. If the instructions say to do a series of one-hour increments, start the week prior to your event so you learn how to whiten teeth safely and know what to expect. It is not uncommon for people to experience some gum irritation and tooth sensitivity when they do teeth whitening at home — after all, you’re not a dental professional with years of experience whitening patients’ teeth. So, take your time, read the instructions, and only apply the teeth whitening gel to the surface of your teeth, making sure not to get it all over your gums. If your teeth or gums become sensitive during the treatment, gently remove the gel completely and try again later. The good news is that even when it is removed, most teeth whitening gels will continue to lighten your teeth for up to an hour, so even if you only fit in a half hour of whitening, you may see some results. If there’s one final piece of advice to leave you with, it’s to not overdo it when whitening your teeth at home. Follow the instructions carefully, and you’ll likely see results without having to do anything extra. Often, people think that the longer they leave the teeth whitening gel on their pearly whites, the whiter their teeth will get. This is true, but leaving the gel on too long is not good for your teeth, and it can result in heightened gum and tooth sensitivity. It is also worth noting that many dentists and doctors recommend that pregnant or nursing women do not use teeth whitening treatments, as is the case for people with dental problems, porcelain veneers, or any other kind of cosmetic dental work. Teeth whitening gel does not lighten dental crowns or composite bonding, so these may need to be replaced to match the color of your newly whitened teeth. If you’re looking for the best teeth whitening treatments in Ottawa, you’ve come to the right place! At Trillium Dental, we offer in-clinic teeth whitening treatments that’ll leave you with a beautiful white smile in an hour. In fact, patients’ teeth are up to nine shades whiter after just one teeth whitening appointment with us! Call us today to schedule your next teeth whitening treatment and experience the difference of professional cosmetic dentistry services like Zoom!® whitening. Of course, we realize that some patients would rather whiten their teeth from the comfort of their own home, which is why we also offer take-home teeth whitening kits that are safe, effective, and approved by our dentists. Plus, they’re affordable and easy to use! Contact us to learn more, or visit Trillium Dental in Kanata, Downtown Ottawa, Orleans, Alta Vista, Stittsville, Stittsville West, or the Bayshore or Westgate Mall to pick up a teeth whitening kit today!